Student group analyses listings and profiles on sharing economy platform Airbnb and discusses its impact on the Berlin apartment market in an interactive storytelling piece. In recent years rents in Berlin have been increasing steadily. Among other factors lodging platforms like Airbnb, Wimdu or 9flats have been criticized for having a substantial effect on the availability of affordable housing space and hence on rent development in general, since they allegedly withdraw, so the argument, regular apartments from the market by renting them out as vacation apartments thus leading to an exacerbation of the problem. But are sharing economy platforms really to blame? How much influence do they really have on the market? The debate has been overheated at times, it seems reasonable to take a step back and look at what the actual data of these platforms has to tell us. 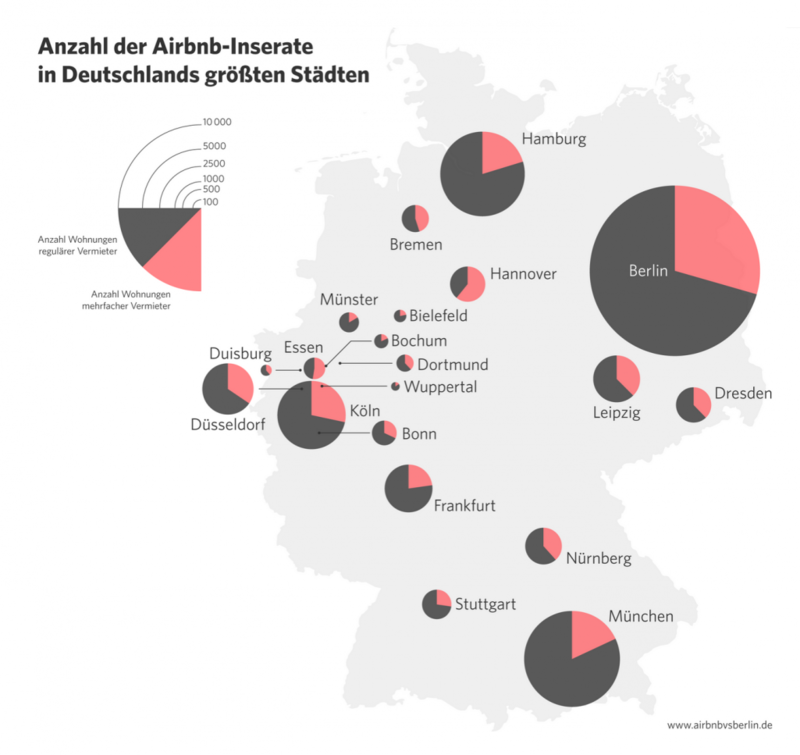 To gather a sample dataset, the public listings and profiles on the largest and most popular platform Airbnb have been scraped for several weeks to establish a solid basis for analyzing the distribution of flats in Berlin according to their location, naming, and pricing. The microsite integrates several simple data visualizations with textual narrative intended for a broad audience to discuss several possibly interesting aspects of the issue. For example, 10% of the users on Airbnb seem to offer more than one apartment or room respectively, with single users advertising up to more than 40 rooms. This indicates a commercial usage of housing spaces. When considering the geographical distribution of apartments from the same renter – as the project illustrates with a network depiction on a map – it becomes questionable whether a single user would be able to look after so many distributed apartments. This geo-visualization also shows four distinct regions managed by one of the top four users, respectively. It looks, as if they divided the city up among each other. Most apartments are located in areas that are popular with tourists. Interestingly, most apartments are concentrated in trendy neighborhood (“Kiezes”) with a high concentration of bars and restaurants, for instance, the Weserstraße in Neukölln, the Torstraße in Mitte or the Simon-Dach-Straße in Friedrichshain. The project also considered the language use in the advertisements. Many apartment names contain words that either refer to location, features of the apartment, or appeal to the viewer with an emotional attribution. Surprisingly, the pricing and sizes of apartments or rooms do not seem to play a significant role in advertising the listings. The site allows the reader to interact with the data visualizations and share them via social media. Within the first few days after publication the site has evoked a considerable media response and has been shared by major blogs and news platforms like Zeit Online and Netzpolitik.org pointing to the interest the public takes in the topic. The underlying data is made available under a Creative Commons license. 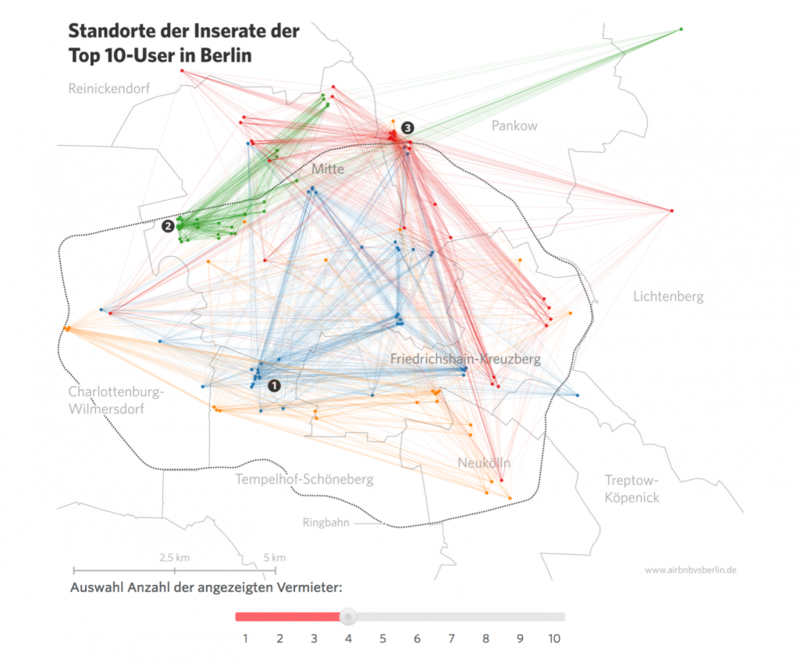 This project was created by Jonas Parnow, Lucas Vogel and Alsino Skowronnek as part of the course “From Reading to Exploring – Telling stories visually in data journalism” at FH Potsdam supervised by Jan-Erik Stange and Michael Hörz.